Dominique Lafon has made a similar transition since he took over in 1987 at Comtes Lafon. “During this period (the late eighties and early nineties), winemaking was close to what my father had been doing; he was a classical winemaker, so there was long aging, two years in barrel, with lots of new oak. The premier crus were 100% new oak. That’s what people wanted at the time: big round toasty white Burgundy became very successful, especially in the U.S.A. All the work we’ve done since then has been focused on a move towards elegance. We use just enough new oak for each vineyard but I don’t want to taste it in the wine. Now aging depends on the cru and some spend longer than others.” Is this change typical for Meursault, I asked. “I think it’s typical for the good producers,” is Dominique’s view. “The first difference between the lieu-dits is the exposition, then elevation on the slope, finally the clay-limestone proportions. There’s about a week’s difference in harvest between Luchets and Narvaux.” Going through the 2013s with Jean-Marc, you move from the restraint of Meix Chavaux or Tillets to the rounder impression of Luchets, the gritty texture of Narvaux, and the more powerful Tessons. Each is distinct. Comtes Lafon may have the widest range of premier crus in Meursault. I tasted all six from 2012 with Dominique Lafon. Bouchères is vibrant and lively, pointing towards citrus, then Poruzots is more stone fruits, Genevrières is rounder with a silky sheen, Charmes, always more backwards, has a smoky restraint, and Perrières is the most powerful. Once again, all are distinct, yet showing that commonality of Lafon’s elegant style. I didn’t mention Coche Dury because I didn’t visit on this trip, but his wines are really the epitome of minerality in Meursault. Some feel that Arnaud Ente is a very close second in this style. No doubt there are still Meursaults in the old style, fat and oaky, but I have to say that I didn’t encounter any on this trip. Previously I’ve always been a devotée of Puligny for expressing terroir in that ineffably steely, mineral style, but Meursault is now running it a close second. Here are four examples to make the point. Domaine Pierre Morey, Meursault Tessons, 2009: “This is a mineral terroir: the rock is about 30 cms down and the roots tend to run along the surface. This was a precocious vintage but the wine was slow to develop and elegant,” says Anne-Marie Morey. A slight sense of reduction brings a really savory impression to the citrus fruits – this one won’t succumb to premox. Fruits are elegant, citrusy, and emerging slowly. 89. Domaine Guy Roulot, Meursault Charmes, 2012: Faintly smoky, mineral nose with citrus fruits. More subtle than Bouchères, more texture, less obvious gloss on surface, but deeper flavors with good extraction and depth. Very fine indeed. 92. Domaine Comtes Lafon , Meursault Charmes, 2012: Restrained smoky nose. Most overt sense of structure among the premier crus, more granular on palate with strong impression that the structured citrus and stone fruits will last a long time. Tension and texture would be a fair summary. 93. Domaine Michel Bouzereau, Meursault Genevrières, 2013: Similar to Charmes with citrus hiding some nuts, but more intensity. Lots of extract here, great concentration of fruits marked by citrus and apples, long finish. Deep and concentrated, this might be what Meursault would be like if it had a Grand Cru. 91. Officially retired, but in practice evident everywhere, Olivier Leflaive is a force of nature. He greets the diners every night at his restaurant and hotel in the town (recommended as an excellent base for visiting producers south of Beaune), and he or his brother conduct tours and tastings every morning at the winery, a modern building on the outskirts of the town. The history of Maison Leflaive is a series of happy accidents. Olivier likes to start at the beginning, in 1635 when Domaine Leflaive already owned vineyards in Puligny, but then he fast-forwards to 1981 when his father Joseph and uncle Vincent were co-managers of Domaine Leflaive. Olivier became co-manager when his father died, and he remained until 1994. “But Leflaive was a small domain, and it had a maître de chai, and it was famous so it wasn’t difficult to sell, it wasn’t challenging enough, and in 1985 I decided to create a negociant. 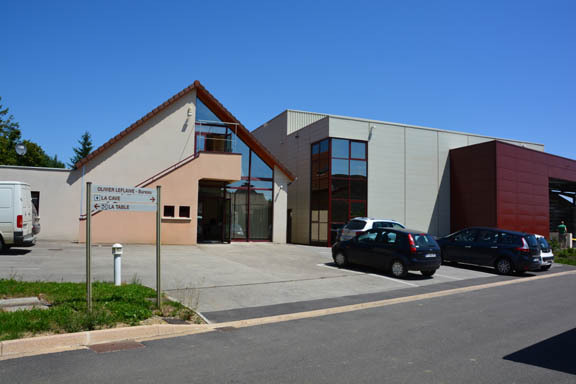 Everyone in Leflaive put in some money.” The business started in the old cellars of Domaine Leflaive – it was big enough for tanks, barrels and bottling; we made 10,000 cases then. The office was my living room and the lab was in the bathroom.” But it expanded rapidly when Frederick Wildman came to Olivier to say they needed a new source of white Burgundy. 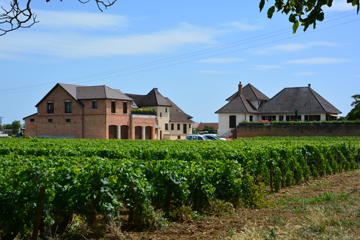 The profits of the business went into buying vineyards, mainly in Chassagne and Puligny, today totaling about 15 ha. There are also some vineyards that represent Olivier’s part of Domaine Leflaive, which he took over after ownership of the Domaine and Maison separated in 1994. When a wine comes solely from estate grapes, it’s indicated on the label as Récolte de Domaine. This is always true for Chevalier Montrachet, for which the only source is estate grapes: in other locations, there are also purchased grapes, and usually but not always they are blended with the estate grapes. Control of the vineyards varies according to the arrangement with the grower. “We harvest 35 ha (including our own 15 ha), but we go to each vineyard and check the grapes as they are harvested and brought here. We stay in the vineyard until harvest is finished. We don’t believe anybody here,” is part of the reason for success. About half the white grapes are pressed at source, by the grower, and then the must is immediately transported to the winery. Typical élevage is 10 months in barrique, assemblage, and then tank for several months. There is never more than 20% new oak. The difficulty in visiting Maison Leflaive is what to taste. “You can taste all 92 wines, from all three vintages that we have at the moment, but then you will have to stay for three days,” Olivier says. 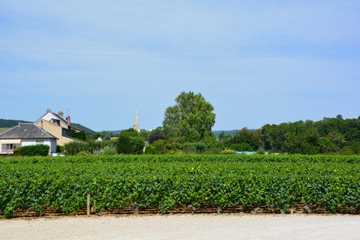 We compromise on a selection from the 2012 vintage including premier crus from the three principal communes (Puligny Montrachet, Chassagne Montrachet, and Meursault), and then taking in Corton Charlemagne. The Puligny Folatières shows focused minerality, Pucelles is richer, Meursault Poruzots has a fuller, broader impression than the Puligny’s, and the Abbaye de Morgeots from Chassagne is the broadest in its expression, with oak just a touch more evident. The Corton Charlemagne has the backbone of the grand cru, with rich fruits of stewed citrus. If I had to choose a single word to describe the style at Maison Leflaive, it would be flavorful. Until the 1996 vintage, you could count on enjoying premier cru white Burgundy from around 6 or so years after the vintage to well over a decade, and you might start grand crus after 7 or 8 years and enjoy for another decade. Then everything changed abruptly, and wines began to show levels of oxidation after only three or four years: the color would darken, the aromas would resemble Sherry, and the palate would seem to dry out. No one knows why premox started so suddenly. The first wines I experienced it with were from the 1996 vintage. It was random, with some bottles just fine while others from the same case were affected, and some producers seemed to have less problems than others, but I’ve subsequently had examples even from the producers who seemed immune. It’s been a disaster for anyone who prizes old white Burgundy, with the window for enjoying the wine really foreshortened. A morning at Comte Lafon ended with a wonderful tasting of his range of premier crus from 2012 and I’ll discuss the changing style of Meursault in a later post, but now I’ll report just on the conversation in which I asked Dominique about the factors that have been associated with premox. “We follow the dissolved oxygen all the way through. We know 1 mgm dissolved oxygen will absorb 5 mgm free sulfur. At the lab, people are satisfied when they get 2 mgm dissolved oxygen in the wine, but we are at the point where we have 0.5 mgm before bottling and it might go up to 0.8 mgm after bottling. “We use special bottles that allow dissolved oxygen to be checked at bottling. Since 2009 we’ve brought the wine back to the lab after 8 months to check the sulfur levels and carbon dioxide and to taste. We bottle with free sulfur around 35, when we check after 8 months it’s always 28-33, we think 20 would be enough.” We walked around to look at the bottling machine. It has some sophisticated additions to vacuum the air out of the bottle and to inject nitrogen. Even in the premox era I’ve had some fantastic old white Burgundies – well, to be honest, it wasn’t intentional, they were in my cellar and I forgot about them, and by the time I found them some were shot, but the best from the late nineties were as brilliant as ever. (I have not done so well with the 2005 vintage whichseems to be aging more rapidly than usual.) I’ve tasted many wonderful wines in Meursault and in Puligny Montrachet this week – reports coming up in later Diaries – and I just hope that the problem has been resolved as these wines all strike me as awfully young, and I’d like to look forward to enjoying them at the peak, maybe a decade or more from now.